Energize your next event with Karaoke! 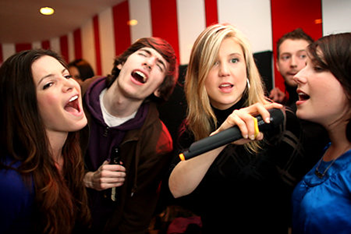 Nothing adds more fun to a party than karaoke. Watch your guests get involved. Watch them roar with laughter. They will go home with wonderful memories of the fun they had. Even people who don’t like to sing will admit they had a blast watching others sing or dance their way through the classics. Why Choose Diamond Dan for your Karaoke? Karaoke doesn’t live up to its potential if your guests can’t sing along with their favorite tunes. At Diamond Dan Productions, we offer 50,000+ karaoke songs at your party or wedding: including Top 40, Oldies, Classic Rock, Country, and more! Our professional sound gear includes digital stereo studio effects (echo, reverb), wired & wireless mics, and LCD video lyric display. Add our giant video projection screen so all your guests can see and sing along. Full DJ dance music library & professional lights also available. Karaoke menus help you choose the latest & most requested songs. We know how to keep a party rolling. Our emcees have lively personalities that will help spice up the show. We know how to make sure people are engaged and having a good time. Your party guests will leave humming their favorite tunes of the night and chuckling over each other’s friendly performances. At Diamond Dan Productions, we have been providing karaoke and other services to our customers for more than 25 years. We have the experience you need to make your party a guaranteed hit. Just ask around any of the communities across Central Illinois, including Peoria, Pekin, Washington, Morton and beyond, and you’ll see how much people rave about our services. Get Karaoke for Your Next Party! Call Diamond Dan Productions to help capture the fun with karaoke! Interested in making your big party even more memorable? See what other services we offer: Photobooths, Weddings, Uplighting, Ceremonies, Corporate Events, & Dances. Contact us today and see the possibilities! 309-657-6264.